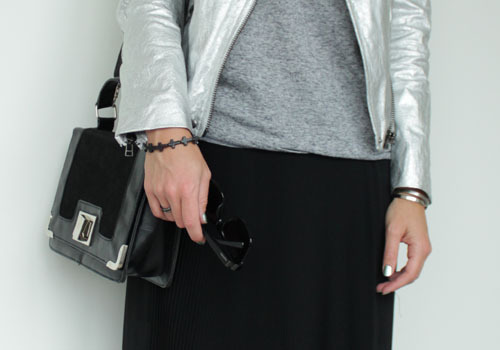 Here an outfit post with two of the items from Augusts online shopping party at Zara (see all items here) in action. I have been drooling over a maxi skirt for a while, but i wasn't sure if a skirt like that would truly be me. When i finally found this one on sale, i was sold to give it a try. I like the transparent fabric, it makes the overall a little more airy, and i can pretend to still be wearing a mini skirt :). I have to say i felt a little self-conscious wearing it the first time, but I am very happy with this buy, it's an addition to my closet which is totally different. 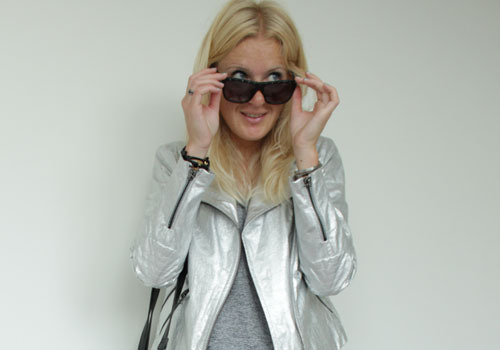 And how cool is the silver biker jacket?! PS i did do some September shopping meanwhile already: a leather skirt (30,00) and two t-shirts (15,00 and 9,00). Adjusted the piggy bank, budget left to pay-day is now 46,00. Pictures will follow!